No one could have predicted how important the 3 Series would be to BMW's bottom line when it first appeared over three decades ago. Times have changed, and the latest incarnation is being touted as the most refined and desirable variant to date. The competition is tough, ensuring that the 3 Series has a fight on its hands. It's a rare thing for a specific model to reach such a ripe old age, but such is the staying power of the 3 Series that it's become a staple of BMW's line-up. A favourite with company car users, recent advances have seen considerable cuts in fuel consumption and emissions performance. As is the case with so many new cars, this 3 Series is bigger, more refined and generally better equipped than the model it replaces. BMW has addressed criticism over the lack of rear legroom while the inclusion of fuel-saving electric power steering will, predictably, be viewed cautiously by keen drivers. Be under no illusions though, as to the pressure the 3 Series is under, as competition in this market segment has never been so tough. Mercedes, Audi, Lexus, Volkswagen and others all want a slice of the action. In its favour, the 3 Series continues to offer the much-vaunted rear-wheel drive layout, plus a continually improving premium cabin ambience and an impressive range of frugal yet powerful engines. As a result of this progress, the 3 Series is a hard act to follow. For some, the car's increase in size makes it more appealing as a premium family saloon, while for others the new generation of diesel engines will result in a lower company car tax bill. It's true that keen drivers might sense a 'rounding off' of the old car's corners as BMW moves to broaden the appeal of its compact premium saloon. The result is a more neutral handling car that requires a concerted effort to unlock its full potential. What is clear, though, is that this balanced character, combined with BMW's latest family 'look' is proof that the German firm continues to produce class-leading executive cars. 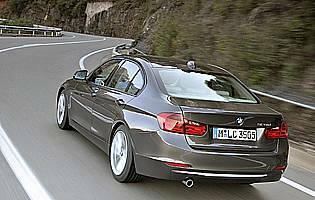 The 3 Series occupies the middle ground in the premium saloon class. With its broad range of engines and trim levels there's something for everyone's budget. High mileage users opting for diesel power benefit from low consumption and emissions plus the resulting tax savings. And despite the car's popularity it remains a good investment, although that does depend on what cost options you select. The default set-up for the 3 Series is very much like most other cars in this class. The remote locking function is a simple and discrete one, while the car's saloon body ensures that your valuables can be locked out of sight for added peace of mind. With the option of user adjustable suspension settings as part of a more comprehensive dynamic mode function, the 3 Series can easily be tuned to a driver's individual tastes. Whoever, even in plain vanilla specification, the 3 Series is a balanced and impressively polished performer, be that on twisty B-roads or coping with poorly surfaced urban streets. The switch to electric power steering is obvious, but rarely detracts from the driving experience. 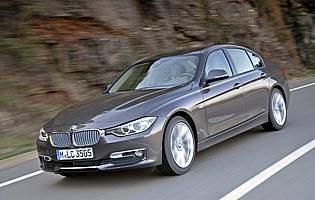 Engine-wise, BMW has replaced many six-cylinder units with, in petrol form, turbo four-pot motors. The aural satisfaction might be missing, but there's no denying the efficiency gains. It's business as usual for diesel fans, as the engines are both more powerful and frugal than before. 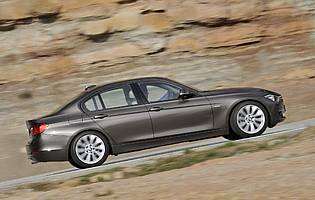 At first glance the 3 Series would be an easy car for a novice to handle. The various controls and displays are easy to comprehend and visibility from the driver's seat is good, making it s a straightforward machine for first time company car drivers. And for a premium class car running costs are manageable, too. As the 3 Series has evolved so has its audio kit. These days the default unit does a good job on all fronts – usability and sound quality. Move up to sat-nav and you can have a car with a wide screen display and a much improved i-Drive controller. Bluetooth phone functions are straightforward, as is the ability to connect an Apple device. Predictably, even with its new clothes, the 3 Series looks best in sombre, metallic hues – it's all part of that executive image. Taking a restrained approach with the cabin is also the best option, as BMW's efforts to attract the youth vote have resulted in some interesting wood-related trim options that are probably more at home in a Volvo.